Between the Confederacy and recognition by Great Britain stood one unlikely Englishman who hated the slave trade. His actions helped determine the fate of a nation. When Robert Bunch arrived in Charleston to take up the post of British consul in 1853, he was young and full of ambition, but even he couldn’t have imagined the incredible role he would play in the history-making events to unfold. In an age when diplomats often were spies, Bunch’s job included sending intelligence back to the British government in London. Yet as the United States threatened to erupt into Civil War, Bunch found himself plunged into a double life, settling into an amiable routine with his slavery-loving neighbors on the one hand, while working furiously to thwart their plans to achieve a new Confederacy. Award-winning author CHRISTOPHER DICKEY, the foreign editor of The Daily Beast, is based in France. Previously he was the Paris bureau chief and Middle East editor for Newsweek. He served as Cairo bureau chief for the Washington Post and, before that, as the paper's Central America bureau chief. His books include the acclaimed memoir Summer of Deliverance as well as Securing the City, Expats, With the Contras, and two novels about espionage and terrorism. "Our Man in Charleston is a joy to discover. It is a perfect book about an imperfect spy." "Thoroughly researched and deftly crafted. [Our Man in Charleston will] introduce people to a man who should be better known, one who cannily fought the good fight at a fateful moment in history." "Dickey tells Bunch’s story with aplomb and a good deal of fine wit. On one level, Dickey has written a spicy historical beach read, chock-full of memorable characters and intrigue. But into this page-turning entertainment, Dickey has smuggled a thoughtful examination of the geopolitical issues of the day...splendid." "A fascinating page-turner that takes on special relevance as South Carolina fills our thoughts in the summer of 2015...[Dickey] brings to life a feverish Southern city, an un-united nation of states, and the 'lively and indiscreet, indefatigable and thoroughly British' man in the middle. Dickey...clearly understands the dance of diplomacy that evolves day by day as personalities and priorities change." "A dynamite tale of international gamesmanship...Dickey’s prose is lively and entertaining. He writes with care for the reader — identifying and characterizing the major players in the political drama that unfolded." "One heck of a good read." "Dickey tells the story of this unsung hero with dash, clarity and a feel for fine detail. ... Our Man in Charleston blows the dust off this forgotten chapter in history and, remarkably, turns it into a thriller." "[Bunch is] a brilliant find…Dickey, the foreign editor of The Daily Beast and a former longtime Newsweek correspondent, uses his research well: in a story like this one, point of view is everything, and Bunch’s is razor sharp." "Dickey has written a book that is as much suspense and spy adventure as it is a history book... A story as compelling as this one does not come around very often. With so much already written about the Civil War, and more coming every year, originality is a rare thing these days. The story of Robert Bunch is that and more." "A fascinating tale of compromise, political maneuvering, and espionage." "Dickey's comprehension of the mindset of the area, coupled with the enlightening missives from Bunch, provides a rich background to understanding the time period….A great book explaining the workings of what Dickey calls an erratic, cobbled-together coalition of ferociously independent states. It should be in the library of any student of diplomacy, as well as Civil War buffs." "A fine examination of a superbly skilled diplomat." "Britain's consul in Charleston before and during the first two years of the Civil War was outwardly pro-Southern and earned notoriety in the North. But in secret correspondence with the British Foreign Office he made clear his hostility to slavery and the Confederacy. His dispatches helped prevent British recognition of the Confederacy. Christopher Dickey has skillfully unraveled the threads of this story in an engrossing account of diplomatic derring-do." "Did Robert Bunch, Her Majesty's consul in Charleston, keep Britain out of the Confederacy's war? Drawing on Bunch's clandestine correspondence, Christopher Dickey makes a compelling case that this dazzlingly duplicitous, ardent anti-slaver played a key role. A fascinating, little-known shard of vital Civil War history, brought glitteringly alive with all the verve and panache of a master story teller." "Our Man in Charleston is a superlative and entertaining history of the grey area where diplomacy ends and spy craft begins. 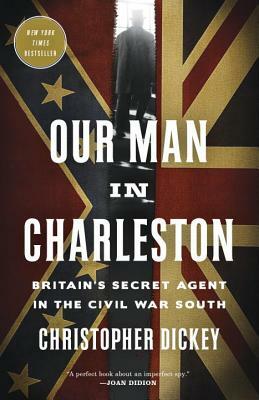 British Consul Robert Bunch played a secret role in the anti-slavery fight in Charleston, which would remain secret to this day were it not for Christopher Dickey's extraordinary detective skills." "Wonderfully written and researched, Our Man in Charleston is the best espionage book I've read. I couldn't put it down." "Robert Bunch is an unlikely spy, but his bravery and moral sensibility make him an intriguing hero for Christopher Dickey's Civil War history. Dickey knows his stuff, from spying to the slave trade, and he's a master at telling a fast-paced, gripping yarn." "Christopher Dickey has accomplished the near-impossible—exhuming a forgotten but irresistible character from the dustbin of Civil War history, and bringing him back to life with painstaking research and bravura literary flair. This irresistible book opens new windows onto the complicated worlds of wartime diplomacy, intelligence-gathering and outright intrigue, and the result is fresh history and page-turning excitement." "A long-needed study of Robert Bunch, British consul in Charleston—a secret agent for the Crown in the Civil War era who outwardly praised the city and its people while privately loathing both, and who discouraged diplomatic recognition of the Confederacy by keeping his superiors abreast of its determination to continue importing slaves. Elegantly written, well researched, an engrossing story."